Glenn Danzig’s comic book company Verotik will be hosting a few special signings at their booth during the festival. 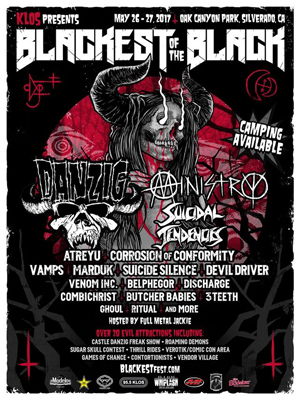 To commemorate the release date of his new album, Black Laden Crown, Danzig has confirmed a rare and exclusive autograph signing session for the first day of the festival only, on Friday, May 26th. Additionally, award-winning comic book artist Simon Bisley will be signing on both nights of the festival, Friday, May 26th and Saturday, May 27th. Bisley has contributed to a number of comics including Verotik, DC, Fleetway, Full Circle, Marvel, and more, as well as DANZIG album covers, including Lost Tracks Of Danzig, 6:66 Satan’s Child, and Thrall: Demonsweatlive. His work has also influenced Beast in the 2006 Doctor Who episode “The Satan Pit”, and Simon Pegg’s character Tim Bisley on the U.K.’s Channel 4 sitcom, Spaced. This Thursday, May 11 from 8:00 a.m. - 11:59 p.m. PT, KLOS-FM will offer a weekend general admission ticket 2-pack for $99.50, plus parking and fees at https://blackestfest.frontgatetickets.com.